Candace H. Johnson-For Shaw Media Jimmy Pecora, 10, of Round Lake, Cole Pemberton, 8, of Fox Lake, his brother, Bryce, 10, and Frank Niecikowski, 10, of Round Lake go trick-or-treating in the Valley Lakes subdivision in Round Lake. 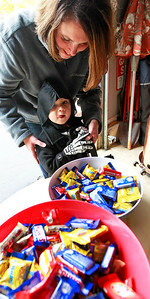 Candace H. Johnson-For Shaw Media Enzo Ramirez, 2, of Round Lake Park gets some help from his mother, Rebecca, picking out candy as they trick-or-treat in the Valley Lakes subdivision in Round Lake. 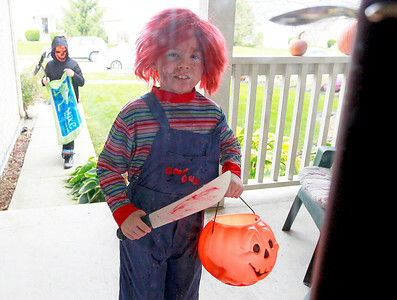 Candace H. Johnson-For Shaw Media Travis York, 11, of Round Lake and his brother, Kolt, 7, come to the door waiting for candy during trick-or-treating in the Valley Lakes subdivision in Round Lake. 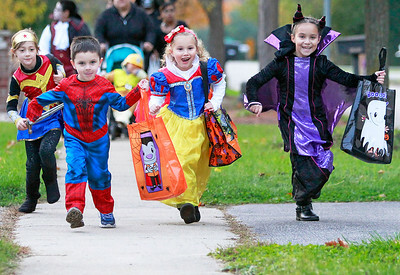 Candace H. Johnson-For Shaw Media Hailey Downing, 7, of McHenry, Lucas Madro, 3, Jadyn Ozick, 5, and Leah Madro, 7, all of Ingleside run house-to-house trick-or-treating down a street in Ingleside. 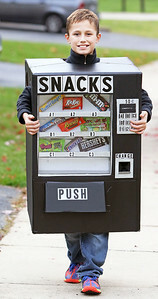 Candace H. Johnson-For Shaw Media Evan Marunde, 11, of Volo walks down the street in his vending machine costume while trick-or-treating in the Valley Lakes subdivision in Round Lake. 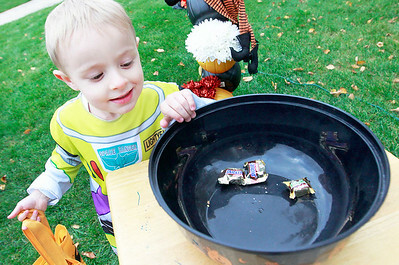 Candace H. Johnson-For Shaw Media Kory Daley, 3, of Lindenhurst gets a piece of candy during trick-or-treating in the Valley Lakes subdivision in Round Lake. Kory was trick-or-treating with his friend, Olivia Tuazon, 3, of Beach Park. 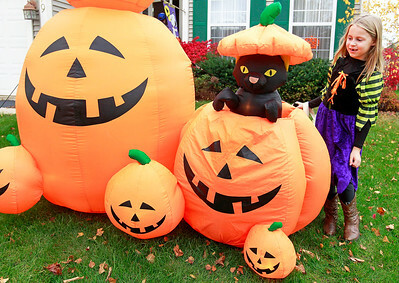 Candace H. Johnson-For Shaw Media Madeline Levandowski, 7, of Lake Villa looks at an inflatable cat in a pumpkin during trick-or-treating in the Valley Lakes subdivision in Round Lake. 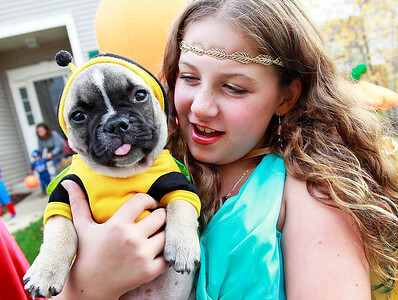 Candace H. Johnson-For Shaw Media Caitrin Myers, 11, of Fox Lake holds Claude Richard, a French bulldog puppy, while she goes trick-or-treating in the Valley Lakes subdivision in Round Lake. 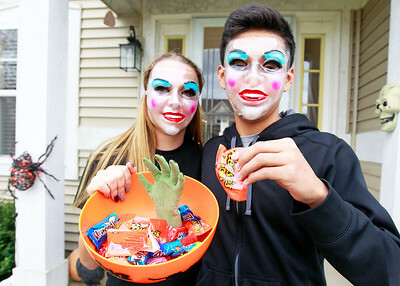 Candace H. Johnson-For Shaw Media Eliza Scoggin and Brian Dorantes, 14, both of Round Lake hand out candy during trick-or-treating in the Valley Lakes subdivision in Round Lake. 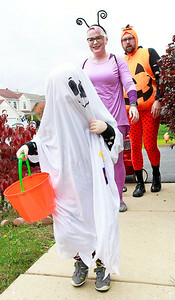 Candace H. Johnson-For Shaw Media Emory Beltranu, 3, of Round Lake and his parents, Katie and Joe, go trick-or-treating in the Valley Lakes subdivision in Round Lake. 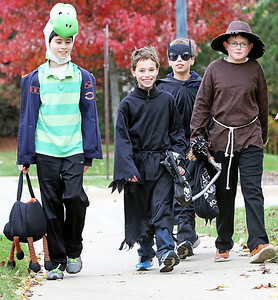 Jimmy Pecora, 10, of Round Lake, Cole Pemberton, 8, of Fox Lake, his brother, Bryce, 10, and Frank Niecikowski, 10, of Round Lake go trick-or-treating in the Valley Lakes subdivision in Round Lake.